There are many indigenous studies centers and offices at universities across the country. 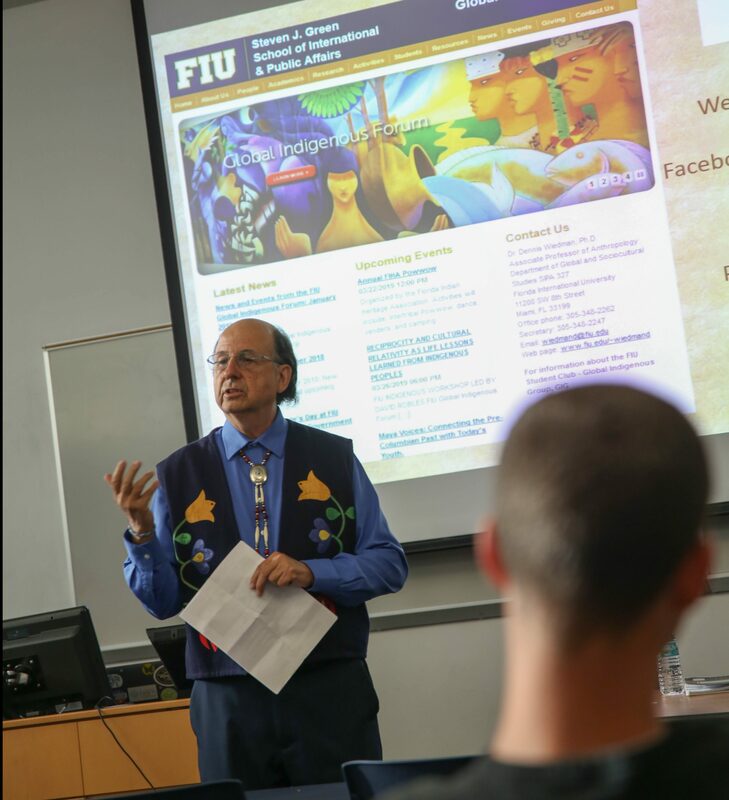 But the Global Indigenous Forum at FIU embodies a unique and internationally-oriented vision that is increasingly making it stand out among similar programs. 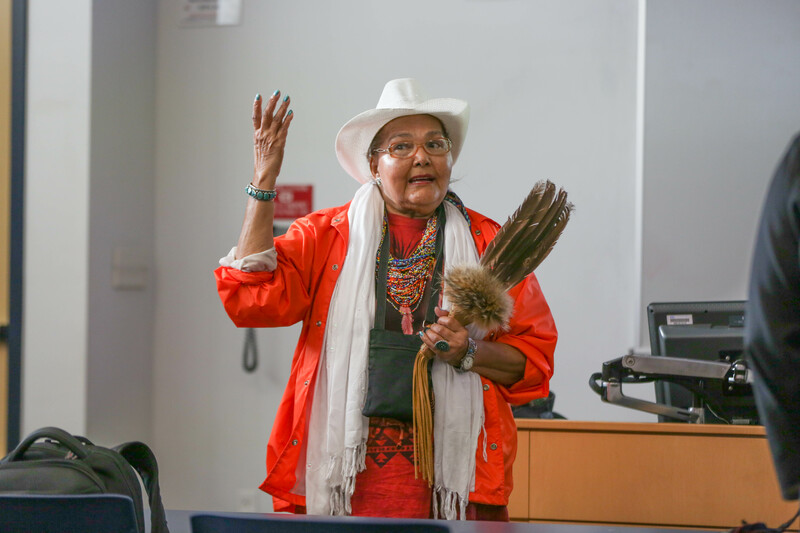 While other offices often focus on the study of regional indigenous groups near the communities of each institution, FIU’s Global Indigenous Forum has actively sought to transcend boundaries. As its name suggests, the forum explores and studies perspectives from indigenous communities around the entire world. The 2007 United Nations “Declaration on the Rights of Indigenous Peoples,” Wiedman says, empowered the original peoples of the continents to seek recognition and rights from dominating settler nations. According to Wiedman, among many people – especially young people – there has been a renewed sense of desire to identify as indigenous. To celebrate indigenous perspectives and explore what exactly it means to be “indigenous” and who is considered indigenous, the forum recently hosted an event featuring an all-female panel of scholars and practitioners to discuss these questions, each from a unique perspective. Speakers included Janos Janine Bowen, a Seneca faith keeper of the Beaver Clan and the director of the Allegany Language Department at Seneca Nation, NY; Candy Hurtado Bonilla, the executive director of the Kuyayky Foundation, an non-governmental organization fostering the Andean Quichua culture; Bina Sengar a Fulbright Scholar-in-residence at FIU from India; and Vanessa Leon, a doctoral student in FIU’s Department of Global and Sociocultural Studies, originally from Ecuador. The all-female panel featured (from left to right): Bina Sengar; Vanessa Leon; Candy Hurtado Bonilla; and Janos Janice Bowen. From the vantage point of their own traditions, research and experiences, each panelist explored numerous aspects of indigenous culture. Just a few the topics speakers shed light about: The history of the Seneca Nation and its matrilineal organization; the way dance and music in Peru transmit Quichua culture; the cultural context related to the word “indigenous” in India and how culture is transmitted; and how the self-identity of a group of people near the Ecuadorian coastline who kept themselves isolated from Spanish settlers has evolved throughout the years. Throughout the discussion – and active question and answer sessions with audience members – attendees heard numerous perspectives. From those who felt that “indigenous” is a colonizer term and one that brings pain and horror to native peoples to those who felt it necessary to re-appropriate the term, identify with it and fight for indigenous rights as a unified group of indigenous peoples. Wiedman says the conversation embodied the forum’s goal – and fulfilled its purpose successfully – by providing a place for the community to engage with numerous and diverse indigenous perspectives. He adds that the forum is also increasingly training more and more doctoral students who will engage in scholarship about indigenous studies and who also identify as being indigenous as well. Before the panel conversation began, Catherine Ramirez Hummingbird, Miami’s Trinidad and Tobago Caribbean Tribal Indian Queen, led all those gathered at the event in a spiritual prayer. The event was co-sponsored by the Global Indigenous Group, a student club that works closely with the forum; the Council of Student Organizations; and the Department of Global and Sociocultural Studies. To learn more about the Global Indigenous Forum, click here.